In just a few days, EFIN will be released on the Mainnet and staking will begin. In order to get your EFIN coin rewards for staking your TPAY, you have to link your TPAY and EFIN wallets. Here’s a quick step-by-step walkthrough on exactly how to do that. 1. Go to My Account in the eFIN Dashboard and look for the TPAY Staking Rewards section. 2. In the field where it says Paste EFIN Wallet Address, paste the EFIN wallet address where you want to receive your EFIN staking rewards. 3. In the field where it says Paste TPAY Wallet Address, paste your TPAY wallet address that you’re staking your TPAY with. 4. 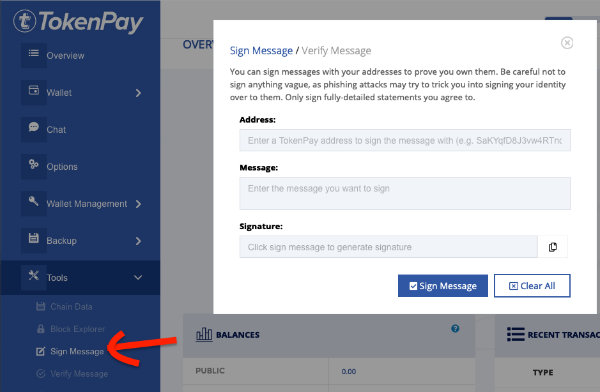 In the field where it says Paste Signed Message, you need to paste a signed message to prove that you own the TPAY wallet. To do this, open up your TokenPay desktop wallet (the one from TokenPay.com; not your TPAY wallet within eFIN). On the left menu, under Tools, you’ll see the Sign Message option. For both the Address and Message fields, paste your TPAY wallet address (use the same TPAY wa address you’re staking with). Then click the Sign Message button. 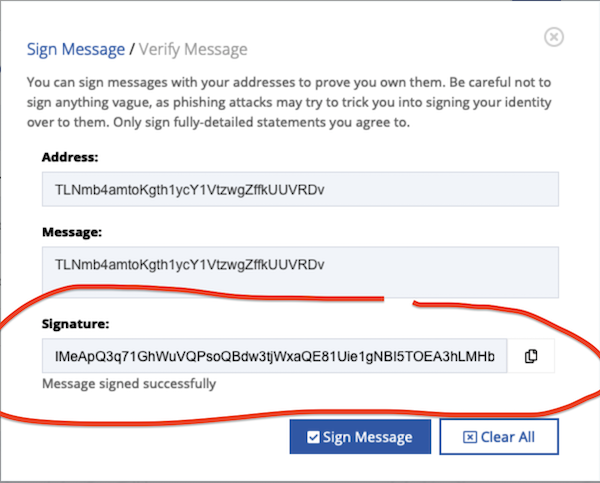 After you click the Sign Message button, your Signed Message will appear in the Signature field. Click the copy icon next to that field. 5. Go back to the eFIN Dashboard to the TPAY Staking Rewards section. Paste your Signed Message into the Paste Signed Message field. 6. Click the Activate button. Note that this button is currently not active. Once EFIN is released on the Mainnet, this button will be active and you can link your EFIN and TPAY wallets. Continue staking your TPAY and when you get TPAY staking rewards, you’ll also get EFIN staking rewards paid straight to your EFIN wallet. Note that your EFIN staking rewards are not automatically paid out in real-time (EFIN staking rewards are currently batch-processed monthly). You will see your EFIN staking rewards credited in the eFIN Dashboard in the EFIN Awaiting Payout box. This is currently processed manually but in a couple of weeks will be completely automated so that a few minutes after you receive your TPAY staking reward, your EFIN staking reward will show up in your eFIN Dashboard. Your EFIN staking reward is based on the number of TPAY that you have in the wallet that won the block reward. So if you have 1,000 TPAY in an address and that address wins the block reward in the TPAY blockchain, you will earn EFIN per the 1,000 TPAY. You must be staking your TPAY at all times if you want to earn as many EFIN coins as possible. To further maximize the amount of EFIN coins you receive, you’ll need to become an eFIN Partner. Once Mainnet launches, the price of a Partnership increases to €495, so be sure to secure your spot now! Staking begins in 3 days! Remember, you MUST be staking TPAY (and be a Partner) by March 31 to earn maximum EFIN coins. Upgrade now and you’ll get a massive staking multiplier (5X for Partners and 10X for Platinum Partners), bonus EFIN coins (100,000 for Partners and 1 million for Platinum Partners), unlimited free trading, free Airdrops of newly listed tokens (like the upcoming CBET token) and a 100% referral bonus. Once Mainnet launches, the price of a Partnership increases to €495. Secure your spot now! 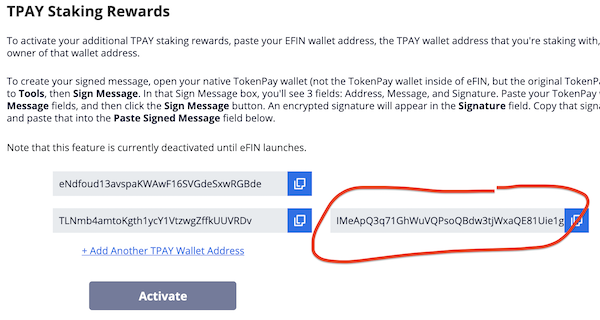 How to Link Your EFIN & TPAY Wallets for Enhanced Staking Rewards was originally published in TokenPay on Medium, where people are continuing the conversation by highlighting and responding to this story.